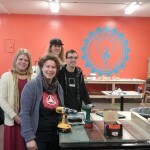 Over the past several years I’ve had the opportunity visit several “makerspaces” and “makerlabs” in both Wisconsin and Connecticut and have been eyeing this growing movement from the sidelines. 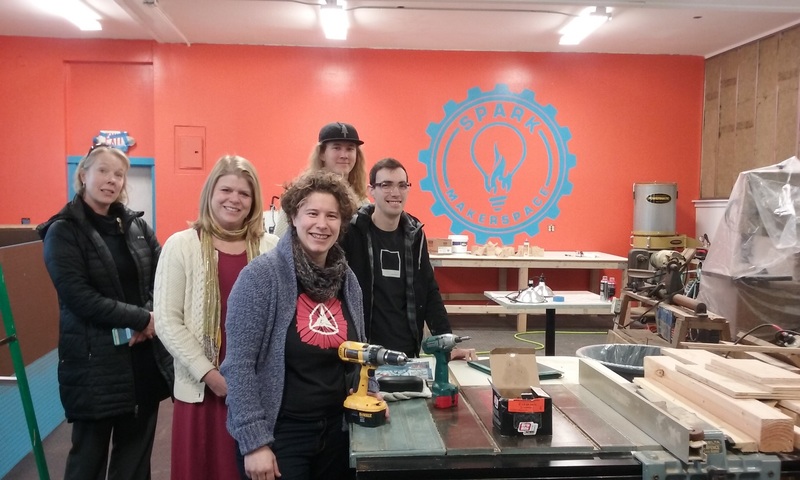 Just a couple of weeks ago I visited the new Spark Makerspace in New London as well as some downtown highlights including the funky freewheeling performance art venue, Hygienic Art and Fiddleheads Natural Food Coop. My tour was organized by colleagues Hannah Gant of Spark, Anna Perch from New London Main Street and Tammy Daugherty from the Office of Development and Planning. The galleries, murals, theaters and coffee shops tucked into New London’s charming main street district are evidence of a long lived and growing creative culture here. Maker spaces seem to have their origins in the cooperative hacker movement in the 1990’s in Europe primarily for computer programmers to share information and ideas. Over the years maker spaces evolved from these origins to include spaces or organizations that share tools and technology such as 3-D printers, software, craft or hardware supplies, tools, as well as resources and and infrastructure like meeting and work spaces. Also called “techlabs” or fablabs” these spaces are governed by their own set of rules but, according to www.makerspaces.com, “…at the core, they are all places for making, collaborating, learning and sharing.” Maker spaces have been promoted as a strategy for entrepreneurship to reduce the costs of startup, product development and design. As centers of research, innovation and creativity, many libraries have even joined this movement to offer permanent or temporary maker labs for children and adults. During my visit to Spark in New London I was greeted by three lively young men who were busy renovating the former El n Gee nightclub into a community run workshop. A brightly lit room was filled with wood working equipment and tools, much of which had been donated or procured from basement clean-outs and yard sales. While the learning center is open to the general public, members pay monthly dues and may access a wood shop, commercial kitchen, 3D printers, CNC machine and laser cutter, robotics lab, screen-printing equipment, shared office space, and retail space. Spark acquired the space in October 2015 and hopes to open in the Spring of 2016.